A major part of the definition for an INES level 7 event is the use of "extended" emergency measures, like evacuation. Now I'm paraphrasing, but the basic idea is that long-term evacuations are sufficient to make it that level of an event. Obviously, the worst radiological consequences one could think of, aside from people dying, is an area being made uninhabitable by humans for a long time. The case of the area around Fukushima Daiichi, again, will not be anything like Chernobyl, and the speculation is that people will start returning to some areas in a few months. The picture isn't so simple because areas within about 3 km of the plant might take significantly longer. Either way, the government is currently mandating evacuations specifically due to long-term exposure in contaminated areas. The 2nd point there doesn't distinguish it from other analysis IMO. Ordinary monitoring points will include dose from accumulated isotopes on the ground... because they are on the ground. But since this group did an aerial survey, it might have been necessary for them to do additional calculations for ground accumulation. This paints a very clear picture of the expected dose, and the red area shows clearly what the 2 rem area is. Not much detail is given in their presentation, but I find it likely that this is a good example of an 'inferred' dose analysis from larger, more sweeping, data and independent of Japanese government reported numbers. But we do have data from the Japanese government agencies to compliment this. 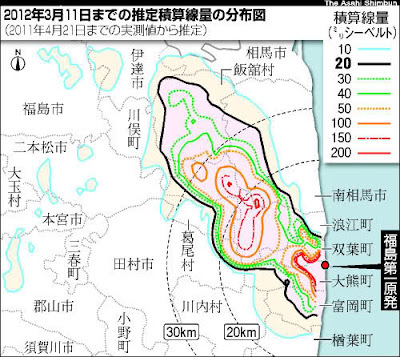 The Asahi newspaper published a map that represents the 1-year dose (Capacity Factor also blogged about this). The units in the upper-right say mili-Sievert, and to convert, 20 mSv is 2 REM. Pretty simple, and matches up well with the other source. The 30 km mark is shown on both graphs, but the 20 km is the area that actually had mandatory evacuations, although the 20 to 30 km sliver had an optional evacuation. By now, the protrusion of the high-dose area to the North-West should be sticking out like a sore thumb to you. I wish that I had more information about the source of this graph and the assumptions with it, but I don't. A week or so ago, they expanded the evacuated area to include that NW protrusion. I'm reporting on this a little late, but I've been trying to lag the news a little bit in order to give a more complete picture. The Asahi offered a fairly good graphic of the areas the government has evacuated, expanded the evacuation to, and applied a special status to. I've applied some English markup to share it here. In order to get a scope of the evacuation and its impacts, I wanted to look a more closely at those affected areas. I looked a Japanese government database and want to share that info here. The following is a table I've put together from that source. I think this is useful, at least, to make conservative estimates or frame the discussion about the impacts. Asahi reports similar numbers for the people evacuated and such, but I wanted to make an independent assessment since this is pretty universal stuff and articulating assumptions is critically important. Below are some of the columns summed. Now, this reflects more than strictly "evacuated" areas, and that is much harder to assess. But then again, maybe that isn't of great interest. Minamisoma, for instance, has been gravely affected by the optional evacuation order. According to Asahi, however, the new mandatory evacuation order only applied to 7 households and 10 people in that city, which is the small yellow area in that area on the map. Seriously. This is a testament to just how non-uniformly Japan is populated - they have huge cities but very few people living in the mountainous regions. So, let's say for a minute that we don't include the 2 major cities on the periphery in summing up the people and economy. This is removing Minamisoma and Tamura cities. All the numbers have been cut about in half. In fact, I don't even understand how this works, because the news had reported that about 200,000 people were evacuated with the original 20 km zone was established, which isn't consistent with the census numbers I'm reporting here. The only way the numbers climb to 200,000 people is if the relatively major cities that never had an evacuation order are included. Again, I think most people still left those places, and I know for a fact that they had problems getting supplies and managing the relief effort due to being within 30 km. I realize that I made a very embarrassing error. I very quickly looked for a place to get the Linear-no-Threshhold coefficient from, this source, which was right, but I used it wrong. The smallest dose for which a measurable increase in cancer has been measured is 100 mSv, or 10 REM. The cancer risk increase is 0.5% to 1% for that dose, depending on the source. The source I quoted had 0.5% for 100 mSv, which is what the literature says, but this divides to 0.00005 cancers / mSv, and not 0.005 cancers / mSv that I so embarrassingly put. This means that while I reported 300 expected cancers, that should have been 3. Now we have a some idea of the dose and risk from initial air-dose exposure as well as the long-term exposure for a year. The trade-offs for evacuation can now be quantified to some degree. Firstly, we can find the number of expected cancers, but in order to compare in some sense, that would have to be given an economic value. I've heard this addressed in classes before by looking at previous litigation dealing with life-or-death choices that automobile makers deal with in regard safety features. Payouts have been in the range of 5 million dollars in the past for compensation for death of a loved one. Obviously, no amount of money can replace someone we love, but risk is something that we make trade-offs for in our own lives. If I lived in that area, I would seriously consider the health trade-off with going back home, especially if I owned a farm or a business where the choice would impact my livelihood. If we consider the evacuated 2 REM and greater area, I would pick about 40 mSv as a average dose by eyeballing it (for the full year). This only applies for the 97,914 population number (less actually). Let's say that they didn't leave - what is the value of the risk they would accept? I will use 1% increase cancer risk per 100 mSv and all those numbers. This number has all kinds of assumptions attached to it, but at least it is based on analysis that has fairly good radiation science behind it for dose and the number of people is fairly straightforward. This is the economic cost of staying, so to speak (my own evaluation of it). What is the economic cost of leaving? Well, I think that the economic product of the area is a good number to start with, because we're at least fairly sure that individuals can not be as productive at their ordinary work when they've been evacuated from where they work and live. Obviously. But there are other factors, so many we can not consider them all. Either way, I will make the bold claim here that the cost of staying is comparable to the cost of leaving, based on the inferred health risk cost and the economic activity of the area alone. I'm mostly happy to point out, and back up, the obvious. But I should stress that this applies to the evacuation zones already discussed in this post. If it is a toss up for that area, then the cost of evacuating more distant areas is almost certainly higher than the cost of staying. Now granted, the government has supposedly made their decision based on regulation/policy that dictates that no member of the public should get more than 20 mSv / year in such an accident situation like this. But it is possible that that criteria itself is a fairly reasonable mark for the balance between the cost of staying and the cost of going. Here are some more things going on around the NC State campus on the nuclear events in Japan. Both of them do note that visitors/guests are welcome, so feel free to share with anyone interested. Nuclear Engineering departments all over the nation have already put on a large number of events, but it continues to be a hot topic as we now transition into the real discussion about national and worldwide impacts of the event. The Japanese earthquake and subsequent tragic nuclear disaster came as a shock to us all. J Michael Doster PhD, Professor of Nuclear Engineering at NCSU, will offer a perspective on the Japanese Nuclear Incident and the societal impact of such events. The NC State Nuclear Engineering department seminar is on Thursday (the 28th) in Room 1202 Burlington Engineering Labs, discussion at 3:45 and talk at 4pm and addresses what appears to be a wide range of issues. Seven weeks after an earthquake and tsunami triggered a nuclear crisis in Japan, the long-term implications for global nuclear energy programs remain unclear. With a 90-day safety review underway, the U.S. Nuclear Regulatory Commission is continuing its approval processes for new reactor licenses and license extensions. Germany has returned to the nuclear phase-out plan it had recently moved away from. Emerging nuclear nations such as China and India maintain ambitious visions for expanding their reactor fleets, but face a range of uncertainties. Meanwhile, global and national concerns regarding energy costs and energy security continue to grow. This presentation addresses questions of nuclear safety, regulation, cost, financing, insurance, public opinion, national policy, and global interconnectedness in this turbulent context. Of course, these are not the only local people active related to the events in Japan. I was surprised to find that a photographer from the local newspaper, the News and Observer, had traveled to Japan after the earthquake and is having a showing this weekend. Recently I was given the opportunity to introduce the topic of the Fukushima Diaster and its implications to an energy discussion group. This is a post to share the handouts and some offshoot media I have from this. Also, looking for good maps of the plant locations, epicenter, etc, I realized that nothing out there really fit what I wanted to show for the full picture. So I brushed up on making kml files and made one myself. For viewing in Google Earth, see my community post. For more simple access, see the Google Maps version (this is actually nothing other than me uploading the prior one to Google maps). Japan gets 30% of its electricity from nuclear power, which is motivated largely by the lack of domestic energy resources. If you look at a history of energy consumption in industrial Japan, the domestic supply for anything like coal, oil, gas, etc is hardly a blip. Japan has 52 nuclear reactors spread over 17 sites all over the nation. The 5 plants on the North-East coast of Japan were shut down by the quake, totaling about 13 GW. Looking at history, it could be 2 years or more before many of these can start up again. 3 plants were hit particularly hard by the tsunami, both Fukushima plants and the Onagawa plant. Ongawa was far-and-away the closest to the epicenter. Decay Heat ‐ A nuclear reactor keeps producing heat after shutdown, and this decreases over time. If there is not a constant flow of water to remove the heat, the temperature will increase, and the ultimate consequence is that rods break and fuel melts, releasing radioactivity. Batteries ‐ Cooling systems powered by the steam from the reactor itself or by natural forces are available to keep the reactor cool for only a limited amount of time since batteries are needed to operate valves. Japan was said to have 8 hours worth of batteries (although they may have lasted longer), which wasn’t enough, and most U.S. plants have 4 hours worth. Containment ‐ Reactors are designed to fail by being built in the middle of a structure that can hold significant pressure, keeping the radioactive particles inside during a meltdown. The containment is the inner structure in this type of BWR, this area is filled with Nitrogen gas so Hydrogen won’t explode there. Hydrogen ‐ At high temperatures this (very typical) fuel type chemically reacts with the water to produce free Hydrogen gas. Because Hydrogen is volatile in air, nuclear safety includes devices to recombine Hydrogen and Oxygen without a dangerous explosion, or prematurely ignite it before it becomes too much. These did not work at Fukushima, certainly in part, due to the lack of power. Many are already recognizing a near-term impact on the new nuclear plant builds in the United States. In fact, the South Texas Project main stakeholder has completely backed out of their new build, directly citing uncertainty stemming from this event. It needs to be said that a serious slowdown in new builds will likely result in decreasing the amount of energy we get from nuclear power. A graph from the LWR Sustainability sums up the situation rather well. Keep in mind, that green sliver is looking highly precarious, and even the orange is coming under attack. This will impact the ability reduce reliance on coal and natural gas. New or old? How should the United States weigh the benefits and risks of stretching our current fleet, building new reactors, new nuclear technology, and other energy options? Reactor Size and Grouping – This event was exasperated by the density of reactors at the site. The trend toward larger reactor size also continues, reducing the probability of a disaster, but increasing the maximum possible magnitude. Waste Storage and Policy – Spent fuel pools have been attacked by critics, which are almost full in this nation due to the federal government defaulting on an obligation to take the spent fuel. Due to the spent fuel pool problems at Fukushima Daiichi, a push to get the fuel to more stable storage may be coming. Severe External Events – Since the 9/11 attacks, severe event preparation has been undertaken at plants across the nation. The fundamental assumption of a terrorist attack is that it cannot be fully predicted (they also can’t tell us much of what preparations were done). Acts of nature of unanticipated magnitude also happen (and could increase), should nuclear plants focus more effort on preparation for events outside the engineering analysis? Informing the Public – This nuclear disaster is different from previous accidents in that the public had access to information regarding radiation levels on their own and acted on this information. We have also seen hourly reports from the operators that fed into a 24‐hour news cycle. Should we plan better for the information channels in the event of a nuclear disaster? How High was the Tsunami? Firstly, many have said that the Fukushima Daiichi tsunami design basis was 5.7 m (height of the sea wall actually), I believe this is wrong to say, although not necessarily wrong. I wish I still had this pdf, but either NEI or ANS specifically said at the end of one of the fact sheets or Q&A papers that they didn't have information specifically giving the design basis tsunami. Had they not heard the 5.7 m number? Hardly. They were well aware of the number, but there was not a solid source for it. You can notice, searching around for design basis numbers for the Fukushima plant, that the earthquake values are given often and clearly. Not so for the tsunami. While I expect the translations have been contorted and pass on like a game of telephone, Tepco themselves use words that indicate 5.7 m as being roughly the "previously considered height for a tsunami", but I do not believe, or at least can not say for sure, this translates into a design basis. As you will see, however, the act of measuring a tsunami itself is not all that clear-cut of a process, and for the technical rigor of licensing of a plant, I would expect a long answer to this question, and not a short one. 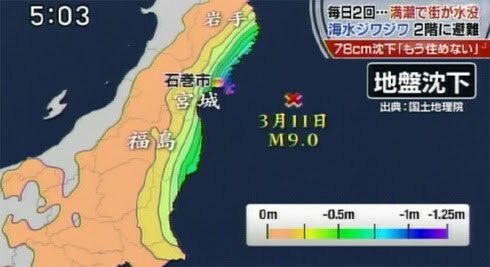 The Japanese National Geophysical Data Center reported measurements for the Tsunami heights measured at locations all along the coast. Different values will be reported by different measuring methods. Sometimes the "run-up" height is reported and other times just a height is measured before the run-up, the inundation height. A slightly objective value can be taken from sea-based measurement mooring platforms which, to the extent of my understanding, experience the tsunami height without the momentum converted into height. And example of this is the observation station used on the Wikipedia page for the disaster. I reproduce this here, and add in the heights as would be reported by the nuclear plants in terms of run-up height. There is a lot to be said from this. The epicenter is marked on the graph, and predictably, the highest waves were seen around that latitude. I made a gray box to indicate the latitudes that no data was available for due to the evacuation order made regarding Fukushima Daiichi. This makes things a little bit harder because we categorically seem to not have diverse measurements for the wave height in that area. There could be some geometry factors that made it higher there, and it's difficult to tell. Either way, the run-up height looks strangely high compared to the neighbors for the Fukushima plants. The wave height, which has another basis for measurement (more later), seems to be in line with the region's other measurements. The Onagawa plant, however, was right in the hardest-hit regions but suffered a wave no higher than the other plants, which I find to be the most interesting data to come from this. Of course, the height of the plants themselves are now the determining factor, which is history. Exactly what happened at the site needs to be covered. Let's start with this fact, when the quake occurred, Japan sunk up to a meter (this isn't surprising when you consider it moved around 2 meters horizontally and accelerated at up to 2 g). I was happy to stumble upon a specific topographic map of this. Here are my interpreted values and the image. 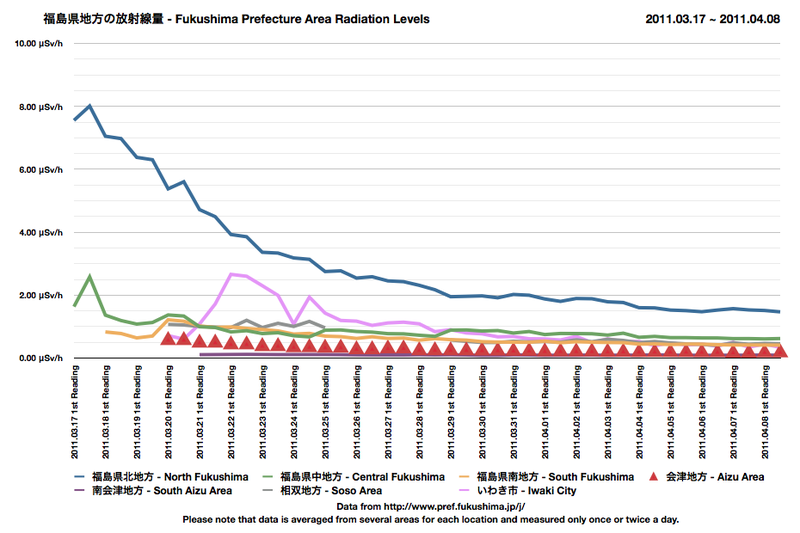 Early reports (including Tohoku Power), it would appear just estimated a drop of 1 m, but this was only for the most extreme case, and my concern about extrapolating this number to places like Fukushima turned out to be founded. Now, in order to understand what on earth a measurement means, you need to understand what the measurement was taken from, and all measurements are, indeed, relative. Most measurements of "run-up" are from the observed height on the building that the water reached. If you know what elevation grade is for the building, then you know the elevation the wave reached. It appears to be the case that this is where all the run-up measurements come from and is how the height is usually reported for the nuclear plants. So, how much of the plant sites were flooded? Daiichi had the entire block of reactors 1-4 flooded to a maximum of 4 to 5 meters, Daini had the reactor area partially flooded less than 1 m and Onagawa didn't have the water reach the reactor grounds. I want to add that the units 5 and 6 of the Fukushima Daiichi site should probably look more like the Fukushima Daini plant. It seems that they were similarly flooded up to 1 meter. The diagram makes a distinction between water that just ran over the area (for Daini) and water that flooded the area. I understand for some areas why, and doubt the utility of it for other areas. As for some other values, I'll offer this table here. I wanted to make an infographic for it, but I'll just not. Sea wall - Height of barrier in front of the intake structures and in the water. This is often given as the design basis. I do not know why I can't find the number reported for the Onagwa NPP, but I tried. Wave height - Height of wave defined by total elevation reached in the intake area before the main slope at the Daini plant. As best I can tell, this would be the "inundation" height, although I have significant uncertainty about that. There is no value for Daiichi because there were no structures standing in this area to deduce the height from. Wave run-up - Maximum elevation that the flooding reached on the plant site, this is after the ground level is added to the height read on the side of the buildings. Note this didn't occur at the reactor building at Daini. RB grade - Grade around the reactor buildings. This is the most key variable in looking at why one plant was flooded and another was not. Shift - All of these numbers are "pre-quake" numbers. Since Japan itself sunk down by these values, all the previous values should uniformly have this number subtracted from them. The difference between these two subtractions is the difference between surviving this disaster with some damage and a INES 7 scale historic nuclear disaster. Amazingly, this can't even be told by just understanding the heights of the waves. It can't be explained by the difference in the elevations in the plants. It certainly can't be explained by the difference in the seawall height (favored Daiichi). It can't be explained by proximity to the epicenter. So how did Daiichi find itself under 5 m of water while the others didn't? The best attempt at explanation I can manage is that the site layout left more flow paths open to the reactor building area at Daiichi. Or maybe it just came in with more force, after all, the intake are structures did suffer much greater damage than Daini. It seems we are left with more questions than what we started with, and this is just the first-cause discussion. It is probably the case the the story of this accident is far from settled. During a disaster, we should certainly strive to deliver the best available information as quickly as possible. If not done correctly, public distrust increases, and while directly avoiding sensationalism, others will step up their own sensationalism. The Fukushima Daiichi disaster was not as bad as it could have been, but it may fit the INES category 7 for nuclear emergencies, which is the most severe type of accident. The Japanese government has made very strong statements indicating it will announce they've upgraded it to that level. I find the borderline between the INES categories to have at least some amount of gray area, and the major component that is required for this to be a level 7 event is vaguely worded as widespread health and environmental effects, or the use of extended countermeasures. I will address a subset of those criteria in this post. That is to say, we assume (for better or worse), that any given radiation dose will cause a given number of cancers by multiplying by the above number. This number will be for expected fatal cancers, and can be applied to a large population. It is "expected" because cancers have a latency period of 2-60 years between when the exposure happens and when the cancer develops. It is my contention that seriously addressing this for nuclear accidents (and informing the public) is important for recognizing the full scale of the accident based on best-available-information. If one uses this assumption for the Fukushima Disaster, how many cancers are expected to result from the accident? I have found no estimates for this, if you know of any let me know. So I had to make my own. This is fairly general and would apply for a more advanced study than what I'm able to offer here, but to be fully accurate, modeling of the transport of the radioactive particles through the environment is very important too, and completely neglected here. The concept of internal dose is a very major topic that will become more and more important as the scale of the accident comes into focus, and it is a notable and intentional omission in this post. Pragmatically, the dose rates are often given in μSv/h. That is, micro-Sievert per hour. It also so happens that dose rates are often recorded once every hour. That means the above task is accomplished by adding all the numbers. Yeah. Not that special. But sometimes they are not taken every hour, and appropriate adjustments must be made. The real world is, of course, complicated and messy. It is even more messy after a record-setting earthquake just hit your town, and that is the environment that these measurements were taken in. 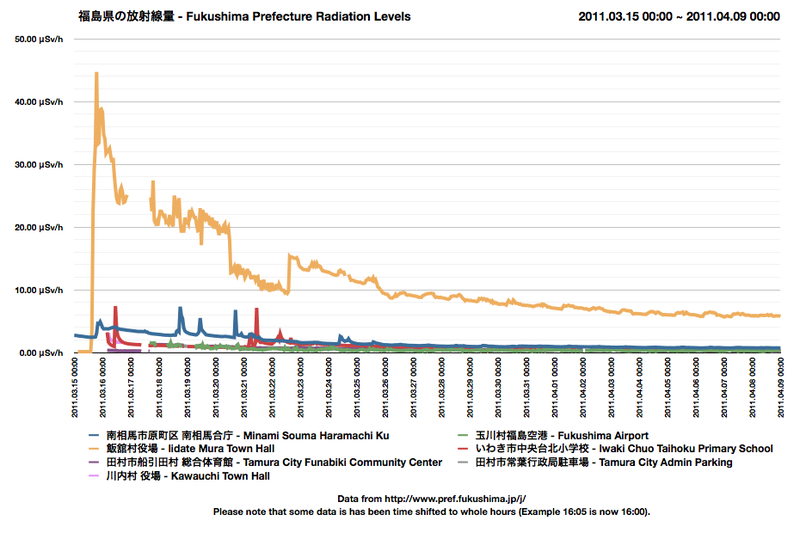 The following are 3 different sets of data are for the Fukushima Prefecture alone. They might look nice and well-behaved, but they are from very different kinds of information sources and do not follow the same methods at all. Note: Doses are calculated from start of monitoring until April 8th or 9th. These three data sets provide a wide range of monitor locations, but there are difficulties. To begin with, they are spaced out in an extremely non-uniform pattern. Some are redundant while other large areas lack readings altogether. I can help illustrate this to a limited extent by offering some maps from other crowd-sourcing radiation monitoring efforts, here I'll use RDTN and Pachube. The Fukushima Prefecture border is slightly hard to make out, but just know that it goes very far into the mountains and the nuclear plants are about midway along the coast. These two projects are using most of the same sources of information that Phillip used (who I got information from). I just hope this gives a good general picture. Although there are dozens of reported locations, I cut it down to just 15 that represent some definable population center, and when multiple readings were available I took the highest (actually doesn't matter as much as you would think). Of course, these did not add up to the entire population of Fukushima Prefecture, in fact, only about 1.4 million of the people in the prefecture of 2.0 million are represented by a radiation reading in the data set. So when I multiply the expected dose to an individual by the population, I also multiply by 2.0/1.4, doing so introduces the assumption that the average dose of the unrepresented population is the same as the represented population. This overestimates in the areas not important enough to take readings in, and underestimates in areas in the exclusion zone (although the population numbers are blown there anyway). Here is what I got. Interpretation: Both high-population and low-population cities and towns had high doses, but long term health risk is mainly accounted for in large cities because of the large population exposed. I could not give enough provisos for the interpretation of this chart with 10 more pages. I offer it only because I have not seen anyone else offer this information. I expect a highly modified pictures when official sources address the issue, but this is a good first shot. Fukushima city, where the largest expected collective cancer risk lies, expects about 34 additional cancer deaths from the radiation from this accident. 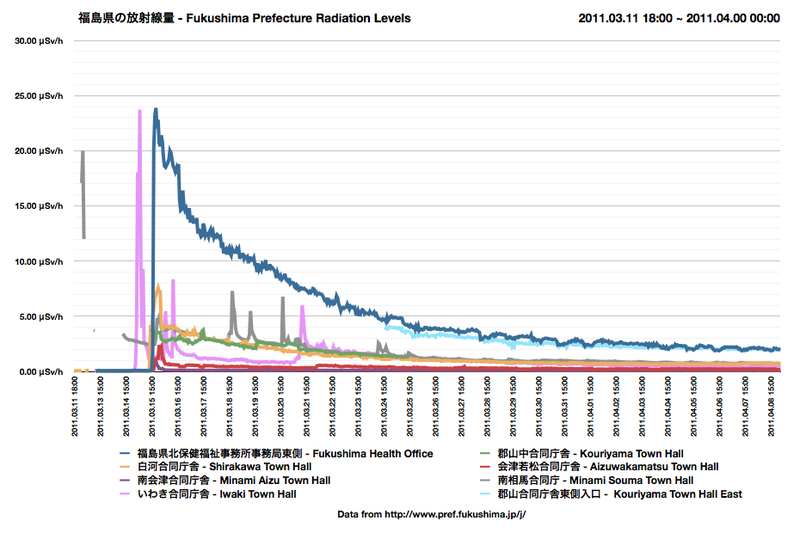 I just want to point out that the city has a population of 290,000 people, which brings me to my first point: We will probably never detect an increased rate of cancer incidence from the Fukushima disaster. Ever. Even if the type of cancer is narrowed down, the statistical noise will probably swamp those 34 deaths. It is still tragic, but in terms of assessing the damages, Fukushima city is the best bet for detecting long cancers caused in the general public, and it is simply not going to happen. Finally, the larger region: People in Ibaraki Prefecture received notably a high dose and Tokyo received several times background for a while, what are the wider consequences? I applied a similar methodology for neighboring prefectures of Ibaraki and Tochigi, again from Phillip (thank you again). In order to obtain a "high" value, I took the location with the highest dose and assumed the entire population was exposed to that. I'll provide just a few notes about this. The same method as described for Fukushima Prefecture was applied for Ibaraki and Tochigi, which was actually easier since there is less information. Then I wanted to include effects on the larger population, so I integrated dose rates in Tokyo, but only for 3 locations. Out of those locations, they varied from 0.05 mSv to 0.06 mSv so I wasn't strongly concerned about the maximum versus average, the main problem is extrapolating this number for a larger area. It is clear from my general knowledge and sense about this (see prior posts) that the entire Kanto region (Tokyo metro, if you will) was subject to similar doses from the passing clouds. Now, it seems absurd to extrapolate to the entire Kanto and Tohoku regions on this basis, but it isn't. The Tokyo metro area is around 30 million, and even including all of Tohoku (everything North of Kanto on the main island) only adds 10 million. For the level of detail I'm concerned with, that 10 million at the same low dose really doesn't matter much to me. What I'm more concerned about is the mid-range doses delivered to prefectures not next to Fukushima, but one over (Miyagi for instance). That can affect the numbers some, but no greater scale than what is already seen on the table, and the entire reason I used Ibaraki and Tochigi in the first place is because I could see on the plots that they had high levels. Here I leave with the final word. Chernobyl was estimated at 4,000 to 6,000 total premature deaths due to the radiation spread. Three Mile Island is estimated at around 1, just 1. Fukushima is somewhere in the middle - we already knew that. Now, I wouldn't be surprised to see a tally of 20 people or a final tally of 1,500 people. Mainly, I don't know where people were, and I don't know how much internal dose they received. These are still people's lives, and I think it allows for classification in the same stratum of accident that Chernobyl was. Aside from these, the complications of relief efforts also had a cost in human lives that I believe could be on a similar scale as the premature cancer deaths. Then there are industries and farmers who lost their livelihood and the people who are wondering when they can return home. Mainly, I want the true cost to be seriously considered by the reasonable people out there. The commonly story about the role of the earthquake in the Fukushima Daiichi disaster is that the quake did some damage, but of course, the tsunami was the overriding cause of the event. While true, I want to provide some historical perspective. In Japan earthquakes are a part of life. Earthquakes are evaluated by using a sensor network to place the epicenter's location and depth, then the reported magnitude is a measure of the pressure wave sent out from that point. The depth, magnitude, and distance (plus geology factors) all affect the type and severity of shaking a point on the ground experiences. The stress that buildings are subjected to are a function of this shaking. For this reason, regulations pertaining to the ability of a nuclear plant to withstand a nuclear plant are formed on the basis of horizontal ground shaking, in the Japanese regulations, the Design Basis Earthquake Ground Motion (DBEGM). There have been repeated concerns raised about the nuclear plants in Japan with regard to earthquake, but I will argue that that the experience of the Kashiwazaki-Kariwa Nuclear Plant in 2007 had the greatest impact on the unfolding of events after March 11th this year. To begin with, the main epicenter of the 2011 Tohoku quake was over 100 km away from the plant, and it wasn't even the closest. In the case of the 2007 Niigata earthquake, the quake was on a previously unknown fault just 15 km from the plant, and this ignited a huge industry effort to revisit the seismic qualifications of all plants in Japan. So, my observation is this: in this year's quake, shaking matched the nuclear plant's rated values because of the 2007 Niigata quake. Note: Units of "gals" are generally used for this application, which are cm/s^2 and, of course, 1/100th of a m/s^2. It's not hard to convert but I'm sticking with g values just so I don't have to explain this. It is true that the design values for shaking were exceeded some amount at the Fukushima Daiichi plant, but as is obvious, the plants in Japan have withstood much worse in the past, and because of those experiences, they have changed their standards. It used to be the case that the nuclear regulation in Japan required two design basis for this, which were the S1 and S2 design basis (higher of which used in the image). This was changed to only one value, the Ss basis. Of course, a risk informed approach would be preferable, which many researchers have worked on. For more information, the World Nuclear Association has a great and up-to-date article on Nuclear Power Plants and Earthquakes. There is much more to be said about the tsunami, of course. It's important to realize that engineering safety is a process that ultimately needs a feedback. Whenever an event happens, the lessons are applied to other units and safety analysis. Also for that reason, no analysis is ever perfect and the next accident will be different from the last. One thing that can be easily said about Fukushima Daiichi is that it is certainly extremely different from past nuclear power disasters, but while saying that, let's not forget about the fact that previous mishaps in Japan's own industry had a significant impact on what the plant was prepared for. It turns out that there is a publicly streaming national network for detectors in many nations. I believe this was not the case for the U.S. before this site was put online not long ago. I'm not sure about the other ones. There is also occasional information coming from independent actors. I think I've noted before a professor in Tokyo who has been streaming his own Geiger counter. People in the U.S. are at work publishing papers on what they've managed to detect. A new bizarre development is that Greenpeace has taken their own measurements. I have to applaud their effort here. My favorite headline is "Greenpeace: Japanese Government’s Radiation Data is Accurate". Anyone reading the major news sources should understand by now just how sensationalist most reporting is, and Greenpeace has the opposite effect. Good job guys. MIT has held a follow-up to their last forum to tackle the new information available. Even so, the lead speaker encourages people to think of it as "Rev zero".